Is the Decoherent Histories Approach Consistent? - MWI has the issue of the very meaning of probability and without a non-circular derivation (impossible in my opinion) of Born rule does not qualify for anything but a "work in progress" status. -Bohmian approach has issues with "surreal trajectories" which invalidates their only hard ontic claim: the position of the particle. "What is different is that by employing suitable families of histories one can show that measurement actually measure something that is there, rather than producing a mysterious collapse of the wave function"
"Any description of the properties of an isolated physical system must consists of propositions belonging together to a common consistent logic" - in other words he introduces contextuality. Critics of decoherent (or consistent) histories use examples which are locally consistent but globally inconsistent to criticize the interpretation. However all 4 statements cannot be true at the same time: when A=B=1 as in (4) then by (1) and (2) C=D=1 and this contradicts (3). So what is going on here? The mathematical formalism of decoherent histories is correct as they predict nothing different than standard quantum mechanics. The interpretation assigns probabilities to events weather we observe them or not, but does it only after taking into account contextuality. Is this a mortal sin of the approach? Nature is contextual and I don't get the point of the criticism. The interpretation would be incorrect if it does not take into account contextuality. Again, I am not an expert of this approach and I cannot offer a definite conclusion, but to state my bias I like the approach and my gut feeling is that the criticism is without merit. PS: I'll be going on vacation soon and my next post will be delayed: I will skip a week. I got a lot of feedback from last 2 posts and I need to continue the discussion. Even Lubos with his closed mind unable to comprehend anything different than the textbooks from 50 years ago and his combative style said something worth discussing. But first let me thank Cristi for the picture below which will help clarify what I am trying to state. Let me quickly explain it: the interferometer arms are like the two sides of Einstein's box and once the particle was launched -for the duration of the flight- you can close the input and output of the interferometer, open the exit just in time and still have the interference. So this seems to contradict my prediction. But does it? This equivalence exists in a precise mathematical sense and respects the three properties of the equivalence relationship: reflexivity, symmetry, and transitivity. Break the Cartesian pair equivalence by any mechanism possible and you get the collapse of the wavefunction. Closing the interferometer, or cutting Einstein's box in half kills the equivalence and the wavefunction collapses. However while the particle is still in flight the process is reversible!!! Open the interferometer's exits in time and you restore the equivalence, undo the collapse still get the interference (Han Solo kills the stormtrooper 100% of the time). However there is a way to make the collapse permanent: just wait enough time with the ends closed such that the energy-time uncertainty relation allows you to reduce the energy uncertainty to the point that you can detect the particle inside by weighing the half-boxes or the arms of the interferometer. Suppose the ends of the interferometer is made out of perfect mirrors. If you wait long enough (even though you are not physically weighing anything) and then reopen the exits will result in loss of interference: this is my prediction. But what happens if you only wait a little bit of time and you are in between full interference and no interference? You get a weak measurement. Now let me discuss Lubos objection and then come back to the nonlocality point Bricmont was making. First Lubos was stating: "If you place some objects (a wall) at places where a particle is certain not to be located, the effect on the particle's future behavior is obviously non-existent". The objection is vacuous. Obviously I don't disagree with the statement, but his entire line of argument is incorrect because collapse is not a dynamic process. If collapse would have had a dynamic origin then we would have had a unitary explanation for it we would have had to talk about the "propagation" of collapse. What the Cartesian pair mathematical framework does is first getting the rid of the consciousness factor, and second clarifying the precise mathematical framework of how the observer should be treated within the formalism. Contextuality is paramount in quantum mechanics and cutting the box changes the context of the experiment. Now onto Bricmont argument. Andrei stated in his comments: " I still do not see the relevance of all this in regards to the locality dilemma.". It has deep relevance as I will explain. And by the way, the rest of Andrei's comments were simply not worth answering-nothing personal: I don't have the luxury of enough free time to answer each and every comment. Bricmont's point on Einstein's boxes was this: "either there is action at a distance in nature (opening B1 changes the situation at B2), or the particle was in B2 all along and quantum mechanics is incomplete "
Option one is clearly not the case. Wait long enough and the interference will no longer happen. At that point the particle IS in either B1 or B2 and shipping one box far away changes nothing. But how about option 2? Is quantum mechanics incomplete? Bohmian supporters think so because they augment the wavefunction with a hidden variable: the particle's initial position. Do we actually need this initial condition to make predictions? Not at all. Last thing to consider: was the particle in say B2 all along? If yes, there is no interference because the which way information. What about weak measurements? This is a case of even more examples of "surrealistic trajectories": combine two interferometers and you can obtain disjoint paths!!! The only thing which makes sense is that the particle does not have a well defined trajectory. My question to Bohmian interpretation supporters is as follows: In the above picture close the arms long enough. What happens to the quantum potential? Does it dissipate? If yes how? If no, do you always get interference after opening the stormtrooper end regardless of the wait time? Finally back to measurement. There is no (strong) measurement without collapse. Collapse happens when a particular equivalence relationship no longer holds. Mathematically it can be proven that the wavefunction is projected on a subspace of the original Hilbert space. Moreover uniqueness can be proven as well: that this is the only mathematically valid mechanism in which projection can occur. Interaction between the quantum system and the measurement device can break the equivalence, but changing the experimental context can achieve the same thing as well. A measurement does not happen however until irreversibility occurs: there could be amplification effects, or as above enough time passes such that the energy uncertainty is low enough and the "which way" information becomes available regardless if we seek this information or not. Last post created quite a stir and I want to expand on the ideas from it. This will also help me get out of an somewhat embarrassing situation. For months now Lubos Motl tried to get revenge on his bruised ego after a well deserved April Fool's joke and became a pest at this blog. The problem is that although I have yet to see a physics post at his blog that is 100% correct, we share roughly the same intuition about quantum mechanics: I agree more much more with his position than say with the Bohmian, GRW, or MWI approaches. The differences are on the finer points and I found his in depth knowledge rusty and outdated. For his purpose: to discredit the opposite points of view at all costs this is enough, but it does not work if you are a genuine seeker of truth. So last time he commented here: "A measurement is a process when an observer actually learns the value of a physical observable" which from 10,000 feet is enough. However this is not precise enough, and now I do have a fundamental disagreement with Lubos which hopefully will put enough distance between him and me. More important than my little feud with Lubos, I can now propose an experiment which will either validate or reject my proposed solution to the measurement problem. I do have a novel proposal on how to solve the measurement problem and this is distinct from all other approaches. I was searching for months for a case of a novel experimental prediction, but when I applied it to many problems I was getting the same predictions as standard quantum mechanics. Here is however a case where my predictions are distinct. I will not work out the math and instead let me simply present the experiment and make my experimental claim. 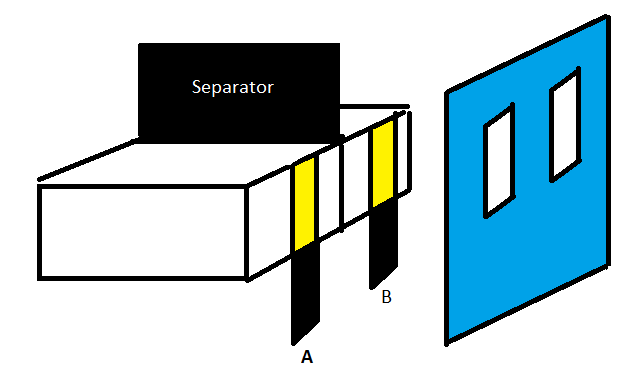 open the two slits A and B without dropping the separator allowing the particle to escape the box and hit a detector screen after the two-slit screen. 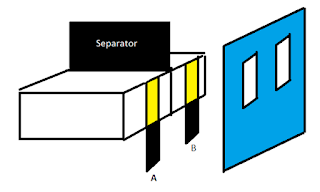 drop the separator and then open the two slits A and B allowing the particle to escape the box and hit a detector screen after the two-slit screen. Next we repeat the experiments 1 or 2 enough times to see the pattern emerge on the final screen. Which pattern would we observe? For experiment 1 we already know the answer: if we repeat it many times we obtain the interference pattern, but what will we get in the case of experiment number 2? If dropping the separator constitutes a measurement, the wavefunction would collapse and we get two spots on the detector screen corresponding to two single slit experiments. If however dropping the separator does not constitute a measurement, then we would get the same interference pattern as in experiment 1. My prediction (distinct from textbook quantum mechanics) is that there will be no interference pattern.